The conference created for family businesses by family businesses. Join us for Family Business Magazine’s second annual Transitions Canada conference, September 26-28, 2018 at the Waterside Inn in Missisauga, ON, just minutes from Toronto's Pearson Internatonal Airport. Transitions Canada is unique among Canadian family business forums: all of our speakers are business family members sharing their stories and experiences in a confidential, "no-sell" environment. This allows for deep conversation and learning for attending family businesses. The family and business financials: to share or not to share? Special Sessions for: Married-Ins, Siblings, Cousins, and a Next Gen Roundtable. Special Bonus: Continue your learning after the conference with a one year subscription to Family Business Magazine (or a one year extension for current subscribers). You will gain access to the on-line archives of the magazine, featuring over 800 relevant articles and interviews. Plenty of time and forums to network with other families. Our confidential and no sell environment. A pre-conference “Family Business Basics” session for first timers. Conference Pricing on Hotel Rooms the days before and after the conference. Limited attendance (150 guests from between 50 and 65 families). There are no outside advisors permitted. Families may bring a non-family executive or their own family advisor. FAMILY FOCUS: Transitions is brought to you by Family Business Magazine, a third-generation family owned company, and Next Gen Anesti Principal John Neretlis, a G2 in his family business and a G2 married-in of his wife’s family business. Brand Strategy Manager, Concept Rehab, Inc. Begin your Canadian family registration here. Begin your US family registration here. The cost to attend is listed below. Members of families who have previously attended a Transitions conference (in Canada, the United States or Mexico) receive a 10% discount on their cost of attendance. Your registration also includes a one-year subscription to Family Business Magazine or a one-year extension to your current subscription. Note: All prices are in Canadian Dollars and are exclusive of HST. US residents and others who wish to pay in USD, please use the US registration form. Attendance at this conference is limited to members, owners, senior executives (including non-family executives and non-family board members) or shareholders of family-owned businesses whose primary business is other than advising family-owned businesses. Senior advisers to family businesses may attend only with family members. Attendance is strictly limited to the first 65 family businesses/enterprises who register. All registrants receive a free one year subscription to Family Business Magazine ($79US value), or a one-year extension to their current subscription. Subscriptions include free online access to Family Business Magazine's extensive online archive of articles, organized by topic. Registration fees do not include hotel or travel expenses. All attendees will be verified prior to acceptance of registration. A family company's advisers may attend only if accompanied by one or more family company members. Registration price includes all conference materials, welcome reception with buffet dinner on September 26 as well as breakfast, lunch and dinner on September 27, and breakfast and lunch on September 28, as well as all refreshment breaks. Cancellation policy: All conference cancellations must be made in writing and sent to Justine Wood, Transitions Events Director, 13631 Maidstone Lane, Potomac, MD 20854, or emailed to jwood@familybusinessmagazine.com. Registrants who cancel more than four weeks prior to the program date are entitled to a full refund of the registration fee less an administrative fee of $150 per registrant; if canceled within four weeks, but more than 10 business days prior to the conference date, 50% of the conference registration fee will be refunded less an administrative fee of $150 per registrant; within ten business days of the conference date and no shows, no refund is possible. Family Business Magazine may cancel the program if attendance does not meet required levels; in case of cancellation or rescheduling, full refunds of registration fees will be made. Travel fares and hotel deposits cannot be reimbursed. This introductory session will highlight some of the key terms, principles, and challenges of operating a business with your family. Join our expert panel as they discuss and answer your questions about family business basics. This is a “should attend” for newcomers to Family Business conferences. Speakers: Saul Plener, PwC Canada; Peter Begalla, Family Business Magazine. Moderator: Saul Plener, PwC Canada. Speakers: Jesse Longo, Senior Financial Analyst, Longo’s Supermarkets; Geena Luckett, G2 General Manager, Luckett Vineyards; Morgan Bayer, Brand Strategy Manager, Concept Rehab, Inc.
Join us for cocktails and a casual family-style dinner at the Crooked Cue located just a short walk from the Hotel. The Crooked Cue is a third-generation family-owned business. Transitions Canada 2018 is sponsored by Family Business Magazine, and is the only conference created for family companies, by family companies. For further information, contact conference host John Neretlis at (647) 229-1664 or email John@anesti.ca. If your company provides services to family businesses, please considering sponsoring the conference. Access to Transitions conference attendees—by attending the conference, a tabletop exhibit and/or by participating as a moderator/panelist is only available to conference sponsors. Alternatively, if you are an adviser to family businesses, you may register to attend the conference with a family member for a business you advise. Canadian Sponsors: Contact John Neretlis at (647) 229-1664, or email John@anesti.ca. US Sponsors: Contact Mike Bachman at (215) 405-6070, or email mike.bachman@familybusinessmagazine.com. Peter Willson joined Willson International Limited in 1997, and is the fourth generation of active Willson family management. Prior to joining the company, Peter worked with Ernst & Young specializing in the audit of healthcare and mining companies. Willson International specializes in Customs brokerage and transborder logistics with a predominant focus on Canada-US trade. He has served as a director and chair of the Upper Canada Chapter of Young Presidents Organization, has been a member of the Regional council for YPO and of the regional board of directors. Peter holds a metallurgical engineering degree from Queens University and an MBA from the University of Toronto. He is a chartered accountant and a certified director from the Institute of Corporate Directors. Morgan Bayer is brand strategy manager for Concept Rehab, Inc. Morgan manages customer and employee communications to reach people in a relevant and engaging way as well as conveying the brand story the company is rooted in: commitment, respect and integrity. Morgan Bayer has a decade of marketing experience in a variety of settings including IT and consumer product distribution. Prior to joining Concept Rehab, Inc., Morgan worked in the marketing agency space where she managed clients that ranged from small to publicly traded and supported their brand development and marketing needs. Graham, Randall and Fraser Linton got their start in the specialty cleaning business by working as a teenager on weekends and evenings at Interior Care, their father´s commercial carpet cleaning business in Toronto. In 1998, Randall created ServiceNational, Interior Care´s national retail services division. It now represents Canada's largest floor care provider, serving over 1,200 retail stores annually. Jennifer Twigg is president of Twiggs Coffee Roasters. Roasting single origin coffees since 1995, Twiggs has grown to 4 locations and a distribution Centre and is currently expanding. After years of managing the day to day operations which allowed Jennifer to bond with people in the community and to focus on continual improvement, Jennifer now focuses on business development, branding, expansion and Twiggs charitable efforts. Jennifer shares her business and life experiences and various venues including speaking at the Governor General of Canada’s leadership conference, keynote speaker to the Women in Business group, Nipissing University and Canadore College Business Programs, and the First Nations Nbising School Business Program. One of Jennifer’s greatest pleasures is hosting coffee roasting demonstrations for young children and groups of students for the opportunity to interact with them and to address all of their curiosities about the roasting process and the coffee industry. Jesse Longo attended Wilfrid Laurier University from 2008 until 2012 and obtained his Honors Bachelor of Business Administration. During his time at Laurier, he worked at KPMG in Waterloo as a co-op student. After graduation, he joined KPMG full time where he obtainedhis CPA, CA designation and worked at KPMG from 2012 until March of 2015. In March of 2015, he decided to leave KPMG and come back to the family business, where he joined the team as a Senior Accountant. He worked in the Senior Accountant role for three years, and just recently switched roles to a Senior Financial Analyst, supporting business operations. Outside of work, he enjoys playing many sports--including, golf, hockey, and baseball--and he also coaches the Minor Peewee AAA team in Guelph during the winter. 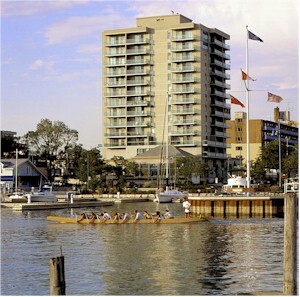 The Waterside Inn is located in Port Credit area of Mississauga, whose motto “Always On, Always Electric” perfectly captures the excitement and charm of this village by the lake. Our location affords the convenience of swimmable beaches a five minute drive away, marinas filled with runabouts and yachts & an array of restaurants and nightlife that offer entertainment options all year round. Called the Muskoka of the GTA, Port Credit is an experience that is truly unique — and unparalleled anywhere. A limited number of guest rooms are available at the reduced Transitions Conference rates: Deluxe Single Suites are $189/night (single or double occupancy) and 2 bedroom suites are $249/night (plus HST and local taxes). Rooms at these special rates are available on a first-come, first-serve basis, and reservations may be made by calling hotel reservations at +1 877.264.7770 ( US/Canada Toll-free ) and requesting the Transitions Canada rate before August 14th, 2018. After this date, reservations may be made based on room availability at the prevailing hotel rate. The Port Credit GO Station is just a short walk (500m) from the hotel. Trains travel regularly from Downtown Toronto Union Station and points west including Hamilton and Oakville. John Neretlis has spent much of life involved in various family businesses: as a Next Gen and Now Gen with his family, and as a married-in Next Gen with his wife’s. In addition to running his consultancy for Family Businesses, John has recently partnered with his teenage son in a new venture, and is chairing his married-in family’s Family Assembly where he directs the G3 training program. John holds an MBA from Queen’s University, is a Certified Human Resources Professional (CHRP) and is certified as a Family Enterprise Advisor (FEA). John volunteers on two boards: Rosseau Lake College, where he serves as Vice-Chair; and Queen’s University Alma Mater Society. He is also an advisor in the development of Queen’s University’s Generational Wealth program. He resides in Toronto, Ontario with his wife Susan, son Matthew (15) and daughter Katie (13).